A Canadian Catholic priest was stabbed in front of dozens of shocked worshippers as he was celebrating mass on Friday morning at Montreal's St. Joseph's Oratory, AP reported. The stabbing attack in one of Canada’s biggest churches was caught on livestreaming on a Catholic channel. 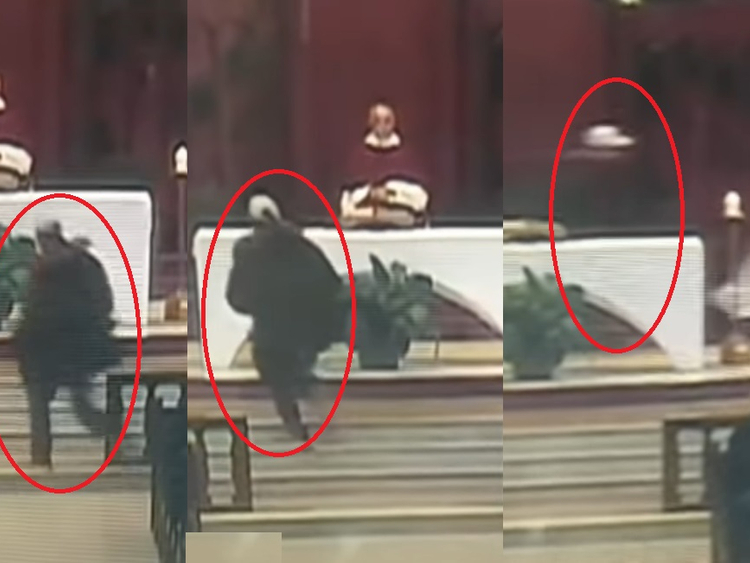 The video shows a tall man in a dark jacket and white baseball cap rounding the altar and charging at Rev. Claude Grou, the Oratory's rector. The man thrusts his right arm toward the priest. The priest runs backward a few steps before the assailant pushes him into a banner. Several copies of the video had been uploaded on Youtube, which some viewers may find disturbing. In the 51-second version of the video uploaded by AP, Father Grou was shown conducting the prayer service when a man dressed in black jacket and a white baseball cap approaches him. The man chased the 77-year-old priest from behind the altar table, knocking down one of the candles stands on his way. The attacker then appears to strike the priest twice, knocking him down. Meanwhile, two people from among the parishioners rose from the pews in aid of the stricken priest and confronted the attacker. The attacker made no attempt to flee the scene. Churchgoers are heard screaming in the background as the altercation took place. RT reported that the priest was then taken to the hospital, where he was treated for minor injuries of the upper body. Police arrived the arrested the assailant, identified as a 26-year-old man. He was expected to appear before a criminal court later on Saturday. There were around 60 people at the church when the livestreamed Friday mass incident happened. It was not immediately clear what the attackers motive was or his state of mind.